Roses may be blooming like wild this summer, but just think about how much you'll miss them during the winter! Why not take advantage of Christmas in July sales and buy some handmade flowers that won't wilt away? Wanda of Gemstones On My Mind grew holiday gift ideas for women from the Saturday Night Specials team. 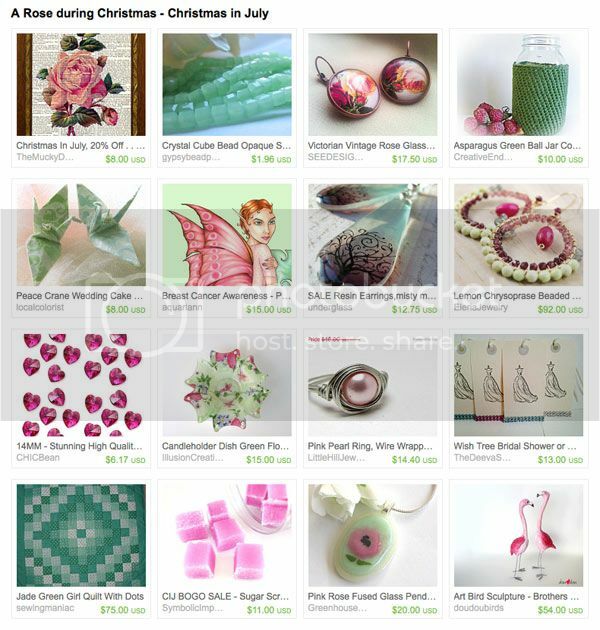 Her rosy finds feature Victorian rose earrings by SEE Designs 2, fused glass rose pendant by Greenhouse Glassworks and my pink ribbon art print. Like a Fairy Tale features my apple -- representing Snow White's poisoned apple! I thought it was a cute theme for a treasury! Thanks for hosting -- that's a lovely treasury you're in!